Dr. Hauschka Tinted Day Cream Review (2018): Is It Worth Buying? Dr. Hauschka Tinted Day Cream Review : Ingredients, Side Effects, Detailed Review And More. What Is Dr. Hauschka Tinted Day Cream? Dr. Hauschka Tinted Day Cream is marketed as a moisturizer cream that hydrates the skin and gives it a sun-kissed glow. The day cream comes in two sizes—1 fl oz and 0.17 fl oz. The tubes are sold for USD 45 and USD 7.50 respectively. Although this product fragrance which may trigger skink irritation. Dr. Hauschka is a natural and organic skincare company that works hard to support the healing not just of humanity but also, the earth. The company is inspired by a vision to create the culture of care, and that is why all of the things that they do is in the interest of promoting the well being of the world. If you wish to protect your skin from the sun and keep it shine-free, you should check out this Dr. Hauschka Tinted Day Cream review! Dr. Hauschka Tinted Day Cream – Does It Really Work? Give skin a natural and subtle glow. Balance the moisture and oil levels of the skin. Support the natural moisturizing functions of the skin. Give your skin an even complexion. Read more of this review to know more about the product! What Are The Ingredients In Dr. Hauschka Tinted Day Cream? Prunus Amygdalus Dulcis (Sweet Almond) Oil: This can help to dislodge debris that is deep within the pores of the skin. It also contains a high amount of vitamin A that can help prevent the development of acne. Persea Gratissima (Avocado) Oil: This is a rich source of monosaturated fatty acids and can hydrate and soften the skin. It can also prevent dry skin and other forms of skin inflammation. Prunus Armeniaca (Apricot Kernel) Oil: This is rich in vitamin K that can reduce dark circles in the eye are and help the skin to achieve a more even complexion. It can also nourish the skin from deep within. Triticum Vulgare (Wheat Bran) Extract: This ingredient helps skin retain moisture while reducing inflammation but also can cause skin irritation to sensitive skin. For best results, apply the Dr. Hauschka Tinted Day Cream evenly in the neck and face after toning and cleansing the skin. Since the day cream is designed to protect skin from heat and light, you should use this only in the morning. This is organic and natural. It does not contain synthetic fragrances, dyes, oils, parabens, PEG, and silicone. The day cream contains fragrant chemicals that can be irritating to the skin. It is also quite expensive for a day cream. According to user reviews, the coverage that the day cream can provide is not enough to cover blemishes. Customer reviews state that this product has a unpleasant smell. 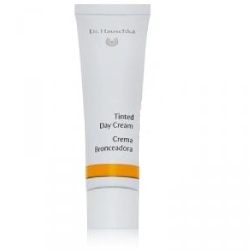 Does Dr. Hauschka Tinted Day Cream Have Any Side-Effects? Since the day cream contains fragrance chemicals, you may experience skin irritation as one of the Dr. Hauschka Tinted Day Cream side-effects. Dr. Hauschka Tinted Day Cream contains the right blend of emollients that can soothe and hydrate dry skin. However, users claim that the coverage that this tinted cream can give is not enough to conceal blemishes so you may need to layer it with another beauty product.